Hazards are faced on a daily basis - some we can anticipate while others come without warning. Regardless of the hazard, educating yourself and your loved ones and taking neccesary precautions in advance can make the difference in an emergency. If you have not already done so, Make a Plan and assemble Go Kits and Shelter in Place Kits for everyone in your household. For more information contact the Nassau County Office of Emergency Management at (516) 573-0636. The time is now. Carbon Monoxide is an odorless, colorless gas that can cause sudden illness and death. Each year over 500 American die from Carbon Monoxide poisoning and thousands of others experience headaches, dizziness, nausea and vomiting from exposure. People who are sleeping or intoxicated can die from CO poisoning before ever experiencing any symptoms. You can prevent Carbon Monoxide Poisoning by installing a battery operated CO detector in your home and check or replace the battery when you change the time on your clocks each spring and fall. Install a battery operated CO detector in your home and check or replace the battery when you change the time on your clocks each spring and fall. Never use a charcoal grill or a barbecue grill indoors. All homes should be equipped with properly working smoke detectors. Approximately 2/3 of all Home Fire Deaths, result from fires in homes with no smoke detectors, or non working smoke detectors. Smoke detectors should be placed in each bedroom, outside each sleeping area, and on all levels of the home. Hard wired smoke detectors need to have a battery back up, in the event of power failure; smoke detectors should be tested once a month, and the batteries should be changed any time a chirping noise is heard, and when you change your clocks for daylight savings time. It is vital that all residents in the home familiarize themselves with the sound of the smoke detectors, and know what to do when the alarms sounds. Family members must develop a Home Fire Escape Plan, which they practice monthly. All rooms should have two ways out, with doors and windows free of obstruction. Once outside of the home, all family members must be aware of the pre determined meeting place, and should not reenter the home for any reason. If any member of the family or pet is still inside, it is vital to tell Firefighters upon their arrival. To help prevent Home Fires, residents should never smoke in bed, or when under the influence of drugs or alcohol. When cooking, residents should not cook when tired, under the influence of drugs or alcohol, or when wearing loose clothing. Unattended cooking is the primary cause of Home Cooking fires. When walking away from the stove, it is vital to turn off all burners. BBQ grills should only be used outside, in a clean safe location, away from all structures. When cooking or using a BBQ, keep children away to prevent fires and injuries. Before using a propane grill always check each fitting, grease pans, and the tank itself for defects and leaks. When utilizing candles in the home, never use close to curtains, paper, plastic, or in a location where it could be knocked over, or cause a burn. Portable fire extinguishers have limits in their capacity to put out fires. Call the fire department if there is a fire. As a general rule, firefighting should be left to the experts. Only use a fire extinguisher if you have been trained to do so. Practice how to use fire extinguishers before a fire occurs. If your clothes catch fire, STOP, DROP, AND ROLL. Stop immediately, drop to the ground, and cover face with hands. Roll over and over or back and forth until the fire is out. If you use a wheelchair, scooter or other device and are able to get to the floor, lock the device first to stay in place before getting on the floor to roll until the flames are out. Use cool water to treat the burn immediately for 3 to 5 minutes. Cover with a clean, dry cloth. Get medical help right away. Fire Safety Drills and practices must be understood and demonstrated by all members of the family to prevent a tragedy. Residents can feel free to contact their local fire department in order to request an evaluation of their home. This pre-planning allows the fire department to know the layout of your home and can pin point places of access as well as point out potential hazards. Anywhere it rains, it can flood. Just because you have not experienced a flood in the past does not mean you will not experience one in the future. Flooding can happen any time of year and for a number of different reasons including Heavy Rain, Spring Thaw, Hurricanes, and Flash Flood. Nassau County participates in the Nation Flood Insurance Program. Visit www.FloodSmart.gov or call the Office of Emergency Management at (516) 573-0636. 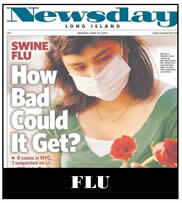 Two strains of flu, seasonal flu and the H1N1 (Swine) flu, are currently circulating in the United States. Most healthy people recover from the flu without problems, but certain people are at high risk for serious complications. Flu symptoms may include fever, coughing, sore throat, runny or stuffy nose, headaches, body aches, chills and fatigue. In H1N1 flu infection, vomiting and diarrhea may also occur. Annual outbreaks of the seasonal flu usually occur during the late fall through early spring. For the 2009-2010 flu season, the H1N1 flu virus caused more illness in young people and pregnant women than is usual for prior flu seasons. Like seasonal flu, illness in people with H1N1 can vary from mild to severe. The best way to prevent the flu is by getting a flu vaccination each year. Get Vaccinated. Vaccination is the best protection against contracting the flu. For the 2010-2011 flu season, most people with need just one shot to be protected against both seasonal and H1N1 flu. Constant threats faced on Long Island are Hurricanes and Nor’Easters. Although we have not experienced a devastating Hurricane on Long Island in some time, that was not always the case. While Nor’Easters may not reach the threshold to be considered a hurricane, their destructiveness can be devastating. It is estimated that over 300,000 residents in Nassau live in flood zones. Know your Coastal Evacuation Routes and look purchase Flood Insurance even if you don’t live in a Flood Zone. If you are told to evacuate, it is critical that you listen to the authorities. Make a plan for you and your family and take into consideration those with special needs and pets. In case of power outages, have a battery operated radio, flashlights with extra batteries, enough non-perishable food and water to last you and your family 7 days, cash in small bills, a 2-weeks supply of medications and anything else you and your family may need in an emergency. To learn more about how you can prepare for a Hurricane, please see our reference materials and contact the Office of Emergency Management at (516) 573-0636. Power Outages can occur any time of year and for a variety of different reasons – usually without any notice. Power Outages can occur due to all types of weather incidents including lightning, high wind, heavy rain, ice and snow. In addition, trees coming in contact with power lines, mechanical failures and cars hitting electric poles. In case of a Power Outage, it is crucial to always be prepared with an emergency kit. Have enough water and non-perishable food to last you and your family for 7 days, a battery operated radio, flashlight with extra batteries, two weeks supply of medications and anything else you and your family may need in an emergency. Power outages can last a few minutes or a few weeks so be prepared. To report a power outage, contact LIPA at (800) 490-0025. LIPA’s Critical Care Program is available for those living at home on life support. For more information on this program or to register, please call (800) 490-0075. For more information on planning for Power Outages, contact the Office of Emergency Management at (516) 573-0636. During summer months, temperatures in Nassau County can exceed 90 and 100 degrees at times. Knowing how to cope in such extreme heat can mean the difference between life and death. Those at the highest risk for heat related death are the elderly, very young, people with mental illness and chronic diseases. However, even young and healthy people can get sick form the heat if they participate in strenuous physical activity during hot weather. Prepare for possible isolation in your home by having sufficient heating fuel. Include storing a good supply of dry, seasoned wood for your fireplace or wood-burning stove. Winterize your home by insulating walls & attics, caulking & weather-stripping doors & windows, installing storm windows or covering windows with plastic.Clear rain gutters; repair roof leaks and cut away tree branches that could fall on a house or other structure during a storm. Insulate pipes with insulation or newspapers and plastic & allow faucets to drip a little during cold weather to avoid freezing. Keep fire extinguishers on hand and make sure everyone in your house knows how to use them. House fires pose an additional risk, as more people turn to alternate heating sources without taking the necessary safety precautions. Hire a contractor to check the structural ability of the roof to sustain unusually heavy weight from the accumulation of snow - or water. Exhaust system - check for leaks / crimped pipes and repair or replace as necessary. Carbon monoxide is deadly with no warning. Oil - check for level and weight. Install good winter tires. Make sure the tires have adequate tread. Never leave children alone in the room where a space heater is running. Turn it off when you are unable to closely monitor it. Have a working fire extinguisher and smoke detectors Establish a well-planned escape route with the entire family. CARBON MONOXIDE SAFETY—CO Poisoning is a silent, deadly killer claiming about 1,000 lives each year in the US. NEVER run generators indoors. • NEVER use charcoal to cook indoors. • NEVER use a gas oven to heat your home. before starting a car or truck after it snows. The most common symptom of carbon monoxide poisoning is headache. Symptoms may also include dizziness, chest pain, nausea, and vomiting. In severe cases, people can become increasingly irritable, agitated and confused, eventually becoming lethargic and lapsing into unconsciousness. Insulate your home - hang blankets over windows and doorways and stay in a well-insulated room while power is out. Eat! Food provides your body with needed energy to produce its own heat and drinking helps your body avoid dehydration. Before installing a generator, be sure to properly disconnect from your utility electrical service. Have your generator installed by a qualified electrician. Run generators outside, downwind of structures. NEVER run a generator indoors. Deadly carbon monoxide gas from the generator's exhaust can spread throughout enclosed spaces. Install a carbon monoxide detector. Fuel spilled on a hot generator can cause an explosion. If your generator has a detachable fuel tank remove it before refilling. If this is not possible, shut off the generator and let it cool before refilling. Wear several layers of loose fitting, warm clothing. The outer garments should be tightly woven and water repellent. Wear mittens and a hat. Mittens are warmer than gloves. Avoid overexertion when shoveling snow. Overexertion can bring on a heart attack—a major cause of death in the winter. Watch for signs of hypothermia. These include uncontrollable shivering, memory loss, disorientation, incoherence, slurred speech, drowsiness and apparent exhaustion. If symptoms of hypothermia are detected: get the victim to a warm location, remove wet clothing, put the person in dry clothing and wrap their entire body in a warm blanket, warm the center of their body first, give warm non-alcoholic or non-caffeinated beverages if the victim is conscious and get medical help as soon as possible.